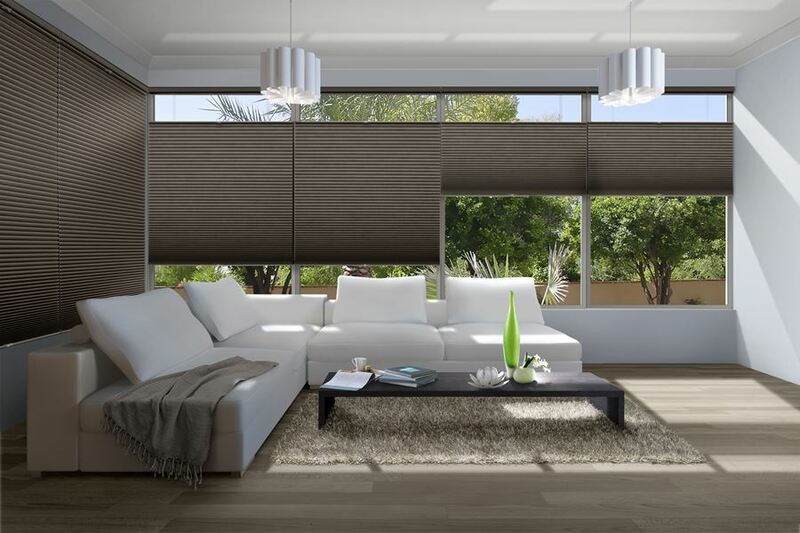 Duette® honeycomb shades are a highly renowned product in the window coverings industry, consisting a huge selection of pleat sizes, fabric choices and lifting systems to meet your home needs. Available in single, double and triple layers. 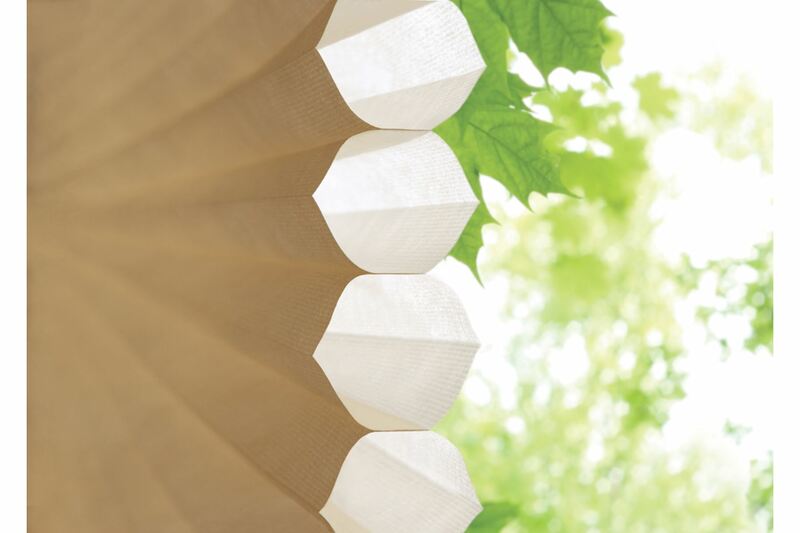 Proprietary 1 1/4″ pleat – The only honeycomb shade that has this size option. Abundant Choice – over 300 fabrics and colors to choose from. Design options like Top-Down/Bottom-Up and Duolite1″ let you maximize natural light and privacy control. 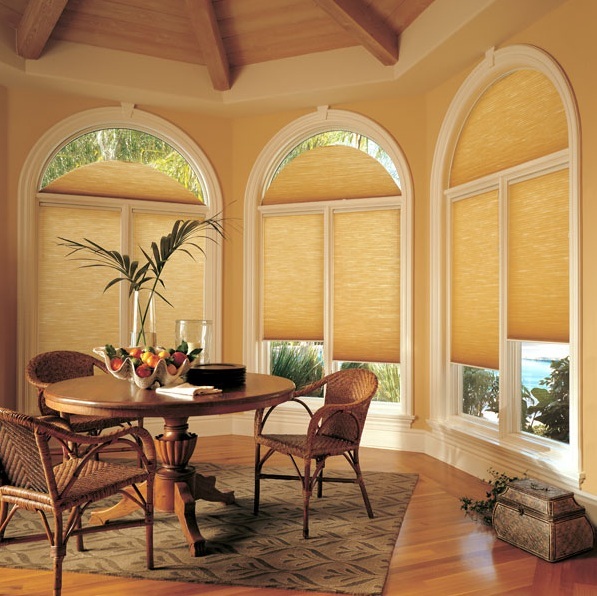 Specialty shapes to fit any window – Duette® honeycomb shades can cover almost any window, from circles to large sliding glass doors. •UltraGlide® lifting system uses a retractable cord, enabling the cord length to remain at a constant length. •All fabrics can be used except for Commercial and Phenomena™ Triple Honeycomb. Please refer to Reference Guide for fabric requirements. •Available with Top-Down, Top-Down/Bottom-Up, Duolite™ and Two-On-One Headrail design options. •Because the cord retracts, it does not pool on the floor or tie up with a cord cleat on the wall, providing a cleaner look. •This system provides enhanced child and pet safety. The cord can be shortened so a child or pet cannot reach it. 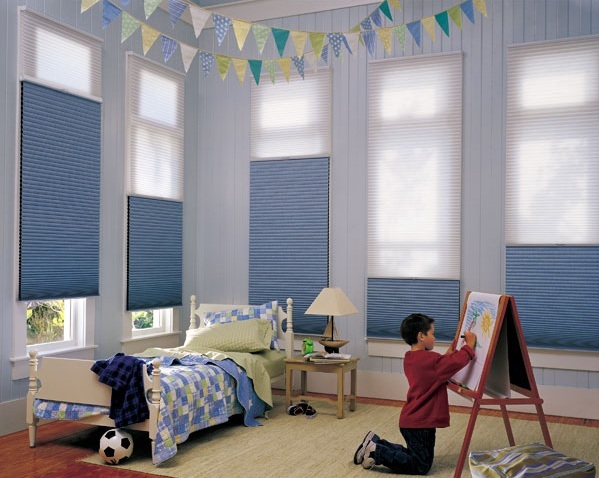 •The consumer chooses from a variety of fabrics and pleat sizes to fit any decor or window. •Variety of design options allows customers to choose the application that best fits their needs. Duolite™ option uses two fabric panels: typically a sheer or semi-sheer fabric is used for the top panel and semi-opaque or opaque fabric is used for the bottom panel. Each panel operates independently, so either fabric panel or portion of fabric panel may be used to cover the window. Available with standard cordlock, UltraGlide® or LiteRise® lifting systems. UltraGlide lifting system provides enhanced child and pet safety because of the constant cord length. LiteRise lifting system provides enhanced child and pet safety because of its cordless design. 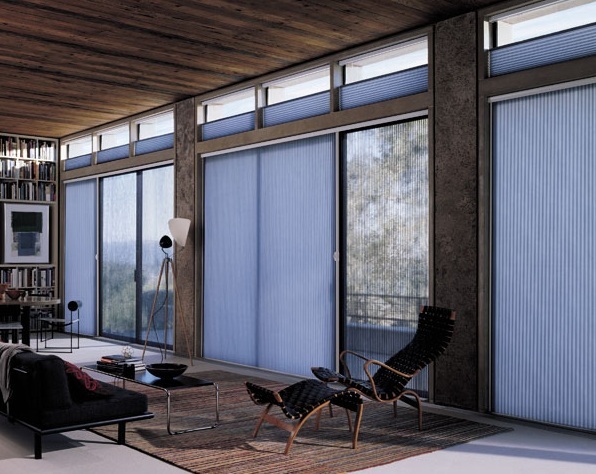 Independent operation of fabric panels allows the consumer to cover the window completely with the top fabric, completely with the bottom fabric, or anywhere in between. •Battery-operated remote control system comes standard with battery wand in headrail. •Available in all fabrics for 3/8″, 3/4″, 11/4″ and double and triple pleat sizes. •Left-side or right-side infrared eye available. •Satellite eye wire lengths: 20″, 4′, and 8′. •Battery pack wire lengths: 15″, 4′, and 8′. •AC transformer wire lengths: 16′ and 25′. •Channel two operation allows for independent operation of adjacent or stacked windows. •No need for contractors to install wiring. Battery operated system is very easy to use. •Many choices are available: Battery pack, remote controls, satellite eye and AC transformer. •Battery pack is needed if the window is high on the wall. The battery pack can be installed low on a wall so the batteries can be reached for easy replacement. •An AC transformer can be used if the customer does not wish to change the batteries. The AC transformer allows the shade to use electricity from a standard wall outlet. •Channel one and channel two operation allows the customer to operate shades independently when they are stacked or on adjacent windows. The recommended minimum distance between infrared eyes is 48″. If necessary, place each infrared eye on opposite sides of the shade. •Fits arch, quarter arch and circle-shaped openings. •Both perfect and imperfect arches are available. •Shares same headrail with the following cordlock shades: Top-Down, Top-Down/Bottom-Up and Duolite™. •The height of an imperfect arch may not be less than 30% of the ordered width. •Can fit many specialty-shaped windows, both perfect and imperfect. •Can coordinate with a shade below the arch for continuity. •Since the Duette® standard arch is inoperable the customer must choose a fabric that allows for desired light control. •Gives a customer a vertical option using Duette® fabric. •Opens and closes from side to side, with a minimal stack. •Four fabric-stacking configurations are available: left stack, right stack, split stack with center opening, center stack. •Duolite™ option available as a center opening design with different fabrics on each side — each able to span the full width of the window. •Duette with Vertiglide allows a customer to use Duette standard shades on a horizontal window and Vertiglide shades on a vertical window. •The four different stacking configurations allow choices for each window design. •Duolite option gives you the choice of two different fabrics in the same window treatment. 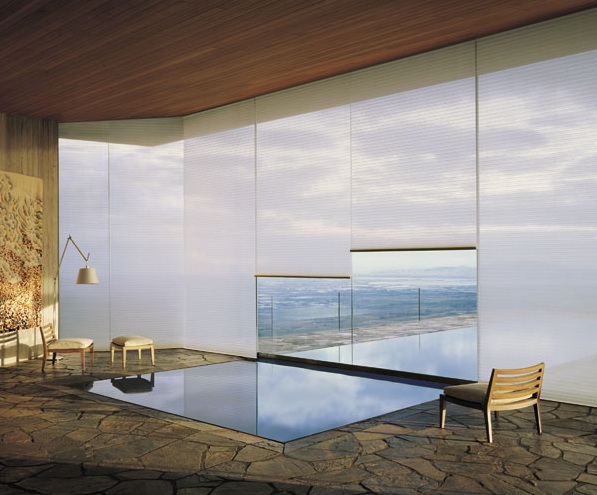 You can choose from sheer to opaque fabric for light control and privacy. •Valance options to meet various needs. • Vertiglide™ shade can fit into tight areas that need to stack off the window. With a 61/2″ stack it is very compact. The Curtain Boutique is an award winning Singapore Curtains & Blinds supplier. We are proud to be an authorised gallery dealer of Hunter Douglas products. Contact us today at enquiry@tcb.com.sg to find out more about our Hunter Douglas Window Shades Collection.